Here are the seven places on our list from the Culture category. When Oriole Park at Camden Yards opened in 1992, it represented a monumental shift in our understanding of what a baseball park should be. For decades, multi-sport stadiums were the design of choice, exemplified by Washington, D.C.'s RFK Stadium and the Oakland Coliseum. While some succeeded, attempting to accommodate sports as wildly different as baseball and football often resulted in poor sightlines, “cookie-cutter” layouts, and a lack of intimacy between the audience and the game. Camden Yards turned all of that on its head as the first retro-classic ballpark, hearkening back to the classic jewel box stadiums of baseball’s early days. Built solely with baseball in mind, it sits on land formerly used as the Camden Station railyard, giving the park its name. Architectural firm Populous (then operating under the name HOK Sport Venue Event) honored that history by incorporating the adjacent B&O Warehouse, a dilapidated 1899 railroad warehouse, into its design for the park. Rehabilitated into Baltimore Orioles team offices, the building has since become one of the park’s trademark features. And though the new baseball parks being constructed today suggest the retro-classic era may be drawing to a close, Camden Yards remains one of the most beloved in the country. Hours: Tours begin March 30. 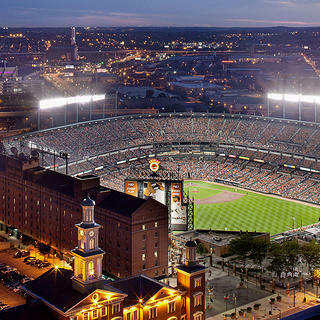 Monday through Saturday, 10:00 a.m. to 1:00 p.m.; Sunday, 12:00 p.m. to 3:00 p.m.
Fun fact: In 1992, the year that Oriole Park at Camden Yards opened, 17 major league baseball teams played their home games in multipurpose stadiums. By 2012, only two teams still did. White tent-like objects rising from a vast, grassy plain aren’t most people’s first idea of what an airport terminal looks like. But the peculiarity of architect Jim Bradburn of Fentress Bradburn’s vision belies the attention to detail with which the Denver International Airport’s Jeppesen Terminal was designed. With the Jeppesen Terminal, Bradburn sought to pay homage to both the snow-capped Rocky Mountains that serve as a backdrop and the Native Americans who originally inhabited the region. It’s what’s known as a tensile membrane structure, consisting of two layers of woven fiberglass coated in Teflon. The outer layer can be seen from the outside, while the inner layer becomes visible upon entering the building. With regular maintenance and soap-and-water cleanings, Fentress Bradburn expects it to last for over 50 years. 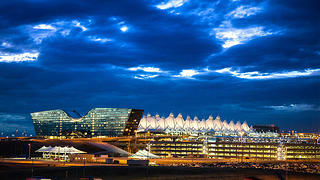 Today, the terminal is the signature feature of the largest airport by land area in the country—perfect for welcoming visitors with an emblematic image of Denver. Fun fact: Fentress Bradburn was constrained by space in their design of Jeppesen Terminal, forcing them to innovate. The terminal is only 150 feet wide. 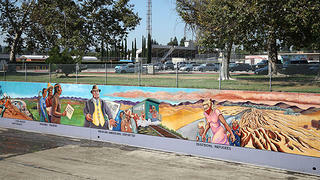 How do you tell the full history of California in a single mural? As artist Judy Baca’s Great Wall of Los Angeles shows, you’re going to need a whole lot of ambition, and a wall big enough to match. At over 2,700 feet long, the Great Wall of Los Angeles is the longest mural in the world. It covers the west wall of the Tujunga Flood Control Channel in North Hollywood. The Army Corps of Engineers reached out to Baca in 1974, commissioning her to create a mural that would help beautify the drab concrete channel. But Baca had more on her mind than mere aesthetic appeal. The Great Wall spans from 20,000 B.C.E. to the 1950s, with an emphasis on the stories of traditionally marginalized groups and communities. Images of forced Native American assimilation are displayed next to a Korean American gaining citizenship, while musicians Elvis Presley and Big Mama Thornton are celebrated side-by-side. To make it all possible, Baca enlisted teams of professional artists and youth from diverse ethnic backgrounds to work for several summers between 1976 and 1983. And despite the enormity of what’s already been accomplished, there’s still plenty more to be done; the final mural is expected to stretch nearly a mile long. Fun fact: An acrylic sealer was applied to the mural to protect it from water damage. However, damage from air pollution, direct sunlight, and fertilizers remains a concern. Seventy miles of bookshelves fill the interior of the imposing Harold Washington Library, the flagship building of the Chicago Public Library system. Ascending 10 stories high and containing 756,000 square feet of floor space, it’s one of the largest library buildings in the country and a distinctive part of the city skyline. Seeking more space to house its approximately five million-volume collection, the city and Chicago Public Library held a design/build competition in 1987. The winner between five finalists was the SEBUS Group, with a design by Thomas Beeby of HBRA Architects. Construction completed in October of 1991. In true Postmodern fashion, the structure pays homage to Chicago’s architectural past while embracing grandiosity. For example, its three disparate horizontal sections are reminiscent of Commercial style architecture from the turn of the 20th century. Seven enormous aluminum owls stand watch atop the pediment like gargoyles, nodding to the Art Institute of Chicago’s embellishments while adding its own unique spin. Hours: Monday through Thursday, 9:00 a.m. to 9:00 p.m.; Friday and Saturday, 9:00 a.m. to 5:00 p.m.; Sunday, 1:00 p.m. to 5:00 p.m.
Fun fact: Queen Victoria of England donated over 8,000 books to Chicago in the aftermath of the 1871 Great Chicago Fire. 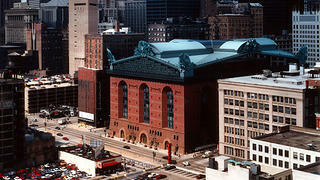 The remnants of this collection are held at Harold Washington Library. In a 20th century filled with iconic moments in American sports, the Miracle on Ice at the 1980 Winter Olympics rises to the top. The U.S. men’s ice hockey team, made up of 20 young amateur players, defeated a Soviet Union squad considered the best in the world (four players on the Soviet team would eventually be inducted into the Hockey Hall of Fame). Combined with the Cold War tensions that underpinned the rivalry, the victory was an underdog story for the history books. It all took place at Herb Brooks Arena, then known as the Fieldhouse International Ice Rink. Renamed in honor of the 1980 U.S. team’s head coach, the 7,700-seat stadium was the centerpiece of the Olympic Ice Center, which included five interconnected rinks of varying sizes and purposes. Construction on the $16.2 million center began in 1977 and was completed in September of 1979. 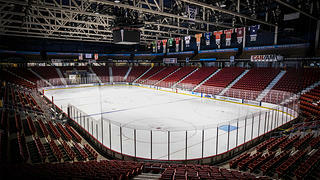 Herb Brooks Arena hosted a total of 20 hockey games over the course of the 1980 Olympics. Today, the rink and the rest of the facility are open year-round to the public for guided tours, figure skating competitions, and, of course, hockey tournaments. Hours: Olympic Center tours available Monday through Saturday, 10:00 a.m. to 1:00 p.m.
Fun fact: Even after the Miracle on Ice, the U.S. team still hadn’t secured the gold medal. They would need another thrilling comeback victory against Finland in their next and final game—also held at Herb Brooks Arena—before bringing home the gold. From its architecture to its programming, the Islamic Center of America was built to serve its community. The largest mosque in North America at around 70,000 square feet of space, it functions as both a leading spiritual and social center for Muslims of all denominations, as well as an interfaith informational resource. 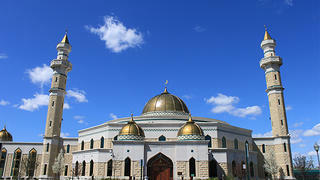 Dearborn is known for its vibrant Shi’a Muslim community, and it was through their efforts that the Center was established in 1963. But the community eventually outgrew its former location, leading them to select architect David Donnellon and designer Paul Bertin to plan the construction of a new mosque. The pair emphasized the wants and needs of the community above all else, traveling to Lebanon and the United Arab Emirates to ensure that their design honored traditional Islamic architecture while still using contemporary materials capable of withstanding Michigan’s variable weather. They used two different exterior finishes—limestone and a synthetic concrete—and combined smooth and split-face texturing. The resulting steel-and-masonry-frame structure, with its approximately 70-foot-high dome and 120-foot minarets, opened its doors in 2005. Its prayer room is large enough to fit 1,000 people, and its community space (used for marriages, funerals, and banquets) can accommodate up to 2,000 more. Hours: Daily, 9:00 a.m. to 5:00 p.m.
Fun fact: While the Center itself is oriented toward the road, its prayer room points 52 degrees east of north—directly toward Mecca. 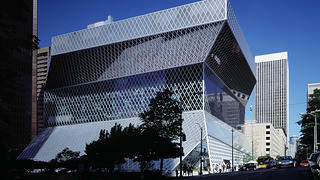 A sense of innovation permeates every aspect of the Seattle Central Library, the glass-and-steel flagship building of Seattle’s public library system. The extravagant contours of the 11-story library's exterior can be easily spotted among the straight lines of the surrounding structures. But the library’s unique design is more intentional and practical than it appears. The guiding principle for architects Rem Koolhaas and Joshua Prince-Ramus of the Office for Metropolitan Architecture, also known for the Villa dall’Ava in France, was that a modern library should be a place equally suited for all kinds of media, not just books. This meant creating nine distinct programmatic spaces, from a parking lot to a “Mixing Chamber” for patrons to easily interact with librarians, laid over top of one another to balance the static and dynamic. Other notable interior spaces include the popular reading room on the 10th floor, filled with natural light and spectacular views, and the Book Spiral housing 780,000 books. Altogether, the structure is a library for the modern day, exactly how its architects intended it. Hours: Monday through Thursday, 10:00 a.m. to 8:00 p.m.; Friday and Saturday, 10:00 a.m. to 6:00 p.m.; Sunday, 12:00 p.m. to 6:00 p.m.
Fun fact: In 2007, the Seattle Central Library was voted as the American Institute of Architects’ 108th favorite structures in the country.